We’re a little behind with the MTB race reports at this end, but they’ll be coming in thick and fast now that the season is well and truly underway. 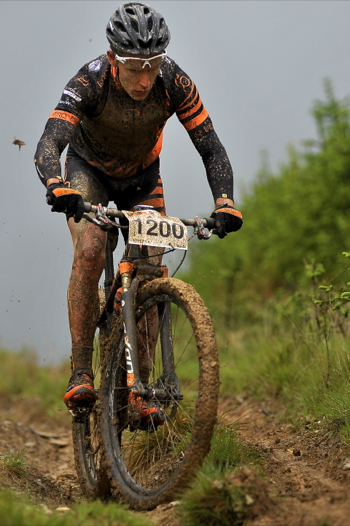 The Scott MTB Marathon Series is what Mountain Biking is all about. 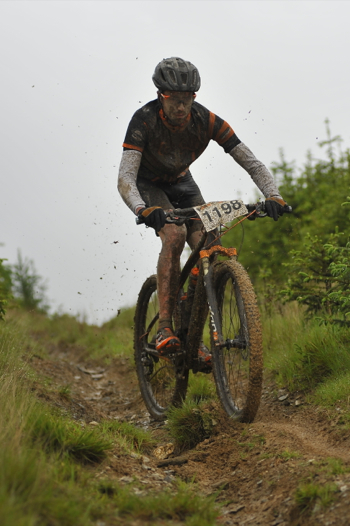 Think of it as a sportive (one big lap), but with knobbly tyres and in the case of Rhayader, North Wales – lots of mud. Upon arrival, at the event HQ entrance, we were greeted by marathon legend John Lloyd spreading hay over the entrance to the campsite. It resembled a scene from the Wizard of Oz with it’s yellow brick road (Ed. Or perhaps John had murdered the scarecrow). Unfortunately Mid-Wales had a real dumping of rain over the last 24 hours and the forecast for Sunday’s ride didn’t look good either, well it was a Bank holiday. Never mind, my Ruby Slippers would be sure to help me to escape at the end! Sunday morning wasn’t quite as bad as predicted, with it being grey but dry, until just before the start when the heavens opened. With a few last minute tweaks to the course, by 10 o’clock several hundred riders had set off to tackle some of Wales’ most challenging climbs and knarly single tracks, the wet conditions making it more difficult than usual. TORQ had a good turn out from the team with 3 male riders and 4 female riders. A couple of the girls had raced the day before (we breed them tough at TORQ). Neil Crampton, 2013 National Marathon Champion, was at the business end of the long marathon distance event ending up crossing the line first, holding hands with Scott’s Nick Craig (who is also incidentally TORQ-Fuelled). The first 4 riders back in the 50k were all from TORQ, including Chris Andrews, Joanne Clay, Carla Haines and Ruby Miller. The whole team finished with almighty smiles and swapping stories of their endeavours.Rain doesn’t spoil an MTB ride, it just makes it more interesting. Chris Andrews: This race for me was merely a training session for me to try and regain some form lost due to a bout of illness. I opted to stick with the 50km route and ease my way back into racing.  A great course was laid out for us and all of my equipment was definitely up to the task in the wet and very muddy conditions. I eventually rolled in second, which was a bit unexpected! Now its onto Margam Park for the third round of the British National XC series. 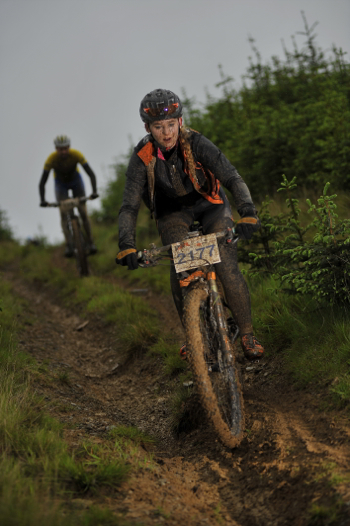 Carla Haines: After being part of the winning team for TORQ at Earlstoke the day before, it was then a 3hr drive in the early hours of the morning up to Rhyader, Mid Wales for the second round of Scott Marathon Series. With only 3hrs sleep and racing the previous day I decided to ride the 50km. 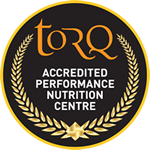 It was a great turn out for the TORQ Team here too, with Lee Westwood, Chris Andrews, Ruby Miller and Joanne Clay all doing the 50km as well. It was another rainy day, but was so excited for another muddy ride. The marathons are great, because generally there’s a steady start to spin the legs before hitting the long climbs. To be honest, I wasn’t expecting to feel so good. In fact I felt pretty damn awesome! I love riding in the mud and this just made me smile all the way round. Some tricky descents with some nice fire track climbs and fun descents, I was having a whale of a time. To top it off, I came in 2nd place with Teamy Jo in 3rd, so another great day for TORQ.